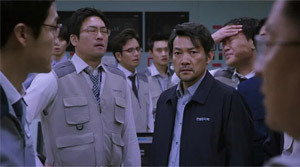 Review: "Pandora" is a red-hot disaster movie which skillfully deals with the political issues in a country where cronyism and incompetence in high departments have recently found its way into the media because of the removed South Korean president. The parallels and the criticism which is sketched in this movie are obvious and the courage with which director Park Jeong-woo at times approaches the subject is admirable. Of course, the Fukushima disaster 2011 is basis for the pivot of this story as well. 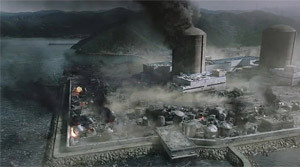 That Japanese moviemakers couldn't shoot a straightforward adapatation of the events for a mainstream audience because the shock of the disaster is still running deep should be understandable and so Korea fills this gap. And not without cause since South Korea is diligently continueing building nuclear reactors while the whole world is slowly dismounting them. It's terrifying to hear that there is actually no reasonable contingency plan and the helplessness of the government officials is bewildering. Naturally, the people are supposed to be left in the dark about the true events and important information is withheld from the president. Even when the president gets rid of the puppet strings on him and finally wants to act he barely seems any more competent than the others. At least he gets off more lightly than the parallels to ex-president Park Geun-hye should allow it. But in fact there is a normal man standing in the movie's focus. Everything but a hero, even to be considered a loser and good-for-nothing who wants to get off the sinking ship at the first opportunity presenting itself. Of course he grows as an individual as the story progresses, but he has a long way ahead of him. A long way - but we are starting to ask ourselves when he is supposed to go down that road exactly. Because after 15-20 minutes the disaster has already struck the townspeople. There is no introduction full of slapstick-like individuals as we are normally used to see until everything ultimately culminates in a dramatic finale, but instead we are thrown right into the action. The battle lines are drawn, the dangers of a reactor accident are presented realistically and that's already when disaster strikes. Therefore, we need to ask ourselves what the rest of the picture, the remaining two hours, actually revolves around! The containment of the disaster, of course. There are constantly drawn parallels to recent events, as well. 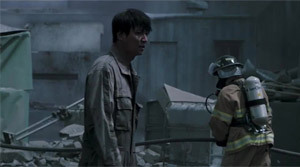 For instance, the firefighters just standing around and waiting for instructions while survivors of the explosion are looking for their colleagues in the rubble are clearly reminiscent of the (non)actions of the government during the Sewol-ferry incident. The rest of the movie is carried by Kim Nam-gil ("The Shameless"), but when it comes to its characters "Pandora" reveals its weaknesses. Somewhere there might be hiding a multilayered personality here, but from what exactly the hero, who in a film like this inevitably has to show himself towards the end, is born from never becomes apparent. Kim Joo-hyun on the other hand isn't convincing as is the case with the rest of the female cast and so the scenes with her and the mother are often enough so drama- and clich�loaden that it's almost painful. 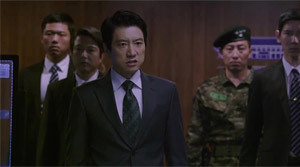 Jeong Jin-yeong ("Ode to My Father") at least can be seen in a decent supporting role and with his depiction of the incapable president Kim Myeong-min ("Spy") surely would have ended up on the ex-presidents black list for artists. So the acting efforts are to be located somewhere on an average level or below. Yet, the film still remains thrilling. 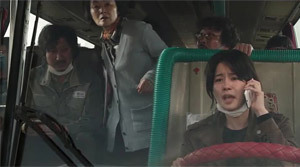 Director Park Jeong-woo has already delivered two convincing movies with "Big Bang" and "Deranged" whereas latter one has sketched as a disaster movie what we get to see in "Pandora" before. In an unadorned manner the director shows us the consequences of radioactive contamination, the subject of being moribund is coming into effect nicely, but despite all well done and sometimes subtle and then again quite straightforward criticism on the Korean government, Park is heading for a familiar terrain in the end, when he commits all the mistakes during an endlessly long tearfest we are seeing from Korean movies all too often. That the movie is too long with its running time of 135 minutes is already posing a problem, but the fact that ten minutes fall on cheap drama is another disaster - next to the reactor incident, that is. This certainly is a big minus in the overall rating. And it's just a shame. Because had some scenes been cut out and others edited a bit differently the couragous and smart criticism present could have come to bear better which would have made "Pandora" a very special disaster movie.